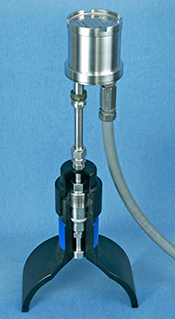 Metal Samples’ new compact MS2700E ER Transmitter measures all types of electrical resistance (ER) corrosion probes. The new high-resolution, 16-bit measurement provides faster response, obtaining corrosion rates in hours instead of days. The transmitter can be remote or direct-mounted (shown). 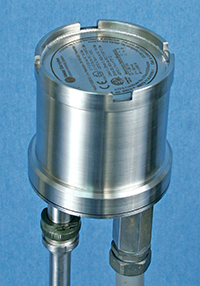 The transmitter is available in a weather-proof (IP66) stainless steel enclosure designed for applications which do not permit aluminum enclosures (such as offshore environments or Zone 0 hazardous areas). Alternatively, a weather-proof (IP66) and explosion proof cast aluminum enclosure is also available. The MS2700E transmitter offers simple installation and robust RS-485 Modbus communication, allowing up to 32 units to be connected in series (daisy-chained) on a single line. Setup is also simple, using a set of switches to select the probe type to be measured, address, and other options. X - see Special Conditions in Operator's Manual.